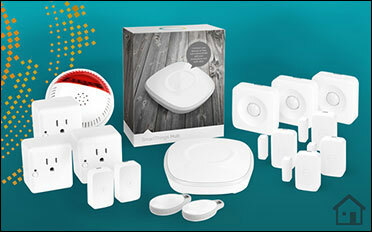 One of the more popular functions of the SmartThings home automation system is home security. So much so, in fact, that the company has developed a kit that caters specifically to home security. Actually, it has three separate kits for catering to those concerned with home security: Smart Home Security kit, Smarter Home Security kit, and the Smartest Home Security kit. Take a look at what each kit offers. Credit: Image courtesy of SmartThings, Inc.
One SmartThings hub: This is the nerve center of the SmartThings home automation system. You need this so that you and your devices can communicate. One SmartSense Motion Sensor: This will detect movement in whatever room you place it in. One SmartSense Moisture Sensor: This will help you know when ­potential leaks are occurring. One SmartPower Outlet: You can plug any electrical device into it and control how and when it operates. 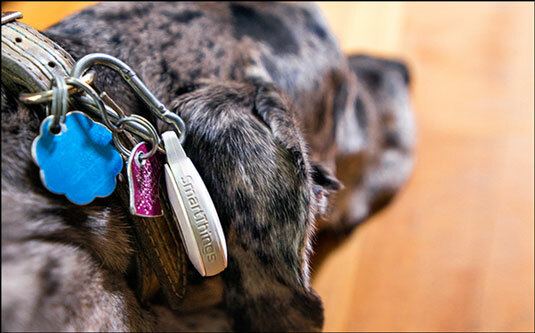 One SmartSense Presence Sensor: This little device is something that people or animals carry on themselves. When they come within, or go outside of, range of the SmartThings hub or other sensor in your home automation environment, the system will ­trigger an alert or some other action. One SmartSense Open/Closed Sensor: This sensor will alert you when a door or window is opened or closed. You can even configure it to trigger your heating or cooling units if they are attached to a smart thermostat. As you can see, SmartThings has you covered in the security department. Controlling your home security devices is a snap using the SmartThings app on your iOS or Android smart device. SmartThings offers other home security devices as well, other than those included in the kits, so browse its website for more items that might fit your needs.